By stayhomecupcake on February 15th, 2013 . Filed under: Crafts, Cupcake Help!, Cupcake Ideas, Decorating . 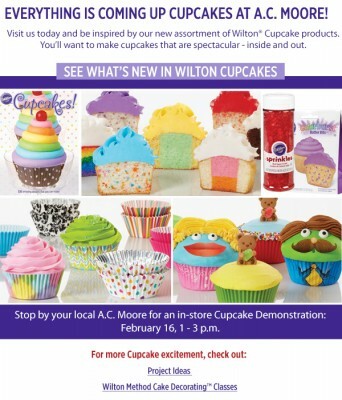 Wilton has some amazing new cupcake products and A.C. Moore wants to introduce you to them this weekend! Stop by one of their many stores on Saturday, February 16th from 1-3 and see free demonstrations of the new products. FYI- if you sign up for A.C. Moore’s emails, they send you free coupons every week!